The handling characteristics of any vessel depend on hull design, propulsion and steering. There are two main types of hull design with variations of each type depending on the intended use of the boat. A displacement hull, whether underway or at rest, maintains the same draft. They are usually heavier, or designed to carry heavy loads, and are slower because all of the underwater part of the hull has to be ‘pushed’ through the water. The power to weight ratio (power of engine compared to weight of boat) is less than on planning vessels which makes them less responsive, taking longer to pick up speed as well as longer to stop. 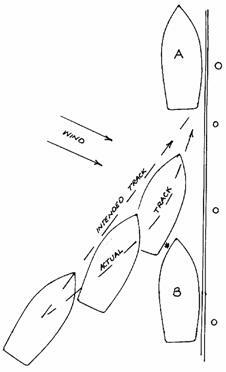 The fixed rudder will produce a larger, constant turn with a tendency for the vessel to lean outwards during the turn. In small boats, this type of handling would perhaps be found on a heavy timber dinghy or a half cabin, with a small inboard engine. A planing vessel at rest sits in the water in its displacement mode. When driven forward at speed the hull design and the forward speed allows them to lift out of the water so they virtually skim across the top of the water. The power to weight ratio is greater by making the hull out of lighter materials and increasing the power of the engine. They pick up speed quickly, go faster, and also stop quickly as they come off the ‘plane’. Their behaviour in a turn, especially at speed in a seaway is less predictable. All of these things mean that a great deal more care must be taken to handle them sensibly and safely. Most small boats that you will be handling will have planing hulls powered with outboard motors, or inboard motors with stern drives in slightly larger boats. Both of these configurations will behave in much the same way, and we will concentrate our discussions on them. If you take the helm of a displacement vessel with a conventional fixed propeller and rudder you will notice the different handling characteristics. You will learn more about this at Coxswain level, but should the occasion arise in the meantime, take things slowly and carefully. One of the things we use to control our vessel when manoeuvring is propulsion, and so let’s look at propellers. Propellers are sized by diameter and pitch. The physical size of a propeller is measured by the diameter of the circle inscribed by the tips of the blades. The diameter of the propeller on any boat will be largely governed by the physical size of the boat itself. The pitch of a propeller is best described as the theoretical distance the propeller (and therefore the boat) would advance in one revolution. 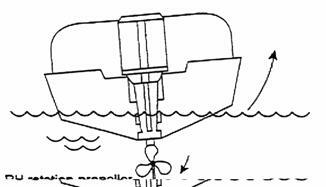 As the propeller is rotating in a liquid, the boat does not advance the full distance of the pitch because of ‘slip’. 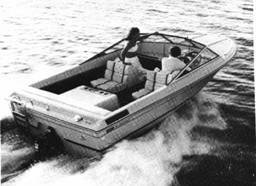 This is greatest when accelerating under full power and becomes less when the boat is up to speed and planing. 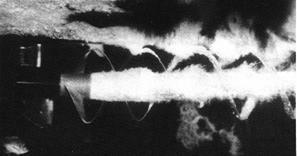 Underwater view showing distance moved forward and cavitation forming on the top of the propeller. Propeller action: As the propeller turns the pitch or twist on each blade could be likened to a swimmer reaching forward with each arm and pulling their body forward. Each blade is doing a share of the work and so the more pitch (reach) and the larger the surface area of each blade (diameter), the more work should be done and thus the further (faster) your boat should go with each revolution. Imagine how fast you could swim with four long arms with huge hands! Of course you would need huge muscles to deliver the energy, and it is the same with your boat. Your engine can only deliver so much energy or power and therefore your propeller needs to be matched to the engine power just as your body would need to increase strength to supply the energy for those four long arms! If your engine is designed to deliver its’ maximum power at 4500 r.p.m. your propeller needs to be the correct diameter and pitch to allow it to do just that. Too much propeller will not allow your motor to attain its optimum r.p.m. and thus is overworking and under performing. It will not give you maximum speed and will use more fuel. Too little propeller will allow your motor to over rev, possibly causing engine damage while still not giving you maximum speed. Your propeller is primarily designed to give you forward propulsion and works most efficiently when going ahead. The design of the hull of your vessel also helps as you get a clear stream of unbroken water to the propeller which gives it more ‘bite’ and reduces ‘slip’. Power should be applied steadily from a standing start. · Excess power can cause excess slip which breaks up the water causing what we know as ‘cavitation’. This gets you nowhere! The underwater picture on the previous page shows cavitation developing on the tips when the blade is at the top of its turn. · In a light vessel such as a tinnie or inflatable (especially when you are sitting at the stern) there is a danger of the bow of the vessel coming out of the water and in extreme cases turning backward on itself - and you! 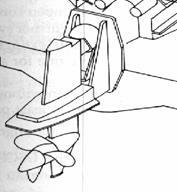 · Your propeller is not as efficient going astern because of the shape of the blades and the broken water caused by your stern wave and the blunt shape of the transom. Don’t expect to stop as quickly as you start. The size and design of your propeller depends on the usage of the boat. A boat used for towing would require a very different propeller to one which required speed only. Therefore, the propeller on a boat used for water skiing would need to be something of a compromise between the two. As well as forward and astern thrust, your propeller causes transverse or sideways thrust. This is often referred to as ‘paddle wheel effect’. If the pitch or twist in your propeller blades was such that they were parallel to the shaft it would act as a paddle wheel and drag the stern of your boat around in circles! Depending on the design of the propeller and boat, transverse thrust will have some sideways effect. Going ahead on a displacement vessel with a right handed propeller (one that turns clockwise and viewed from astern) transverse thrust will wind the stern of the vessel to the right or starboard and there will be a corresponding movement of the bow to port. This is not all that noticeable when going ahead because the rudder takes care of it. It will make its presence felt when going hard astern when there is broken water over the rudder. The stern will wind to port and the bow will go to starboard with very little you can do about it! On light planing vessels with high powered outboard engines transverse thrust shows itself in different ways but for the same reasons. 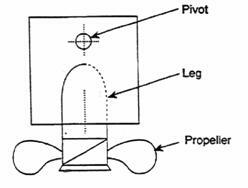 In figure 1.6 you can see that the motor, pivots around a point forward of the leg which forms a type of rudder. The propeller sits behind this and pushes the boat along. When you put your motor into gear and apply power the propeller tends to wind the motor to starboard causing the bow to go to starboard. The more suddenly you apply power, the more dramatic will be the response. Keep a firm grip on the wheel and anticipate it! 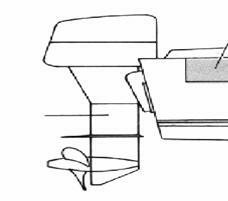 Once at speed, this tendency to turn to starboard is corrected by the adjustable trim tab fitted under the cavitation plate. Another result of transverse thrust at speed is the tendency for your boat to list or lean to one side. Because your boat is light and the engine powerful, the leg tries to ‘climb’ out of the water. With a right handed propeller, the leg will tend to ‘climb’ to starboard, causing a list to port. This can be corrected either by placing the driving position and other heavy items on the starboard side, or by fitting trim tabs on larger planing craft. Propellers are made for engine and gearbox combinations that turn the shaft in either direction. They are described as either right or left handed. Looking from astern a right handed propeller turns in a clockwise direction for ahead power and anti-clockwise for astern (refer Fig 3.3). For a left handed propeller the opposite applies. The propeller rotates and draws us along using axial thrust and produces a side effect called transverse thrust, also known as paddle wheel effect or prop walk. Transverse thrust is caused by the increase in water pressure and density with depth making the propeller blades more efficient at the bottom of their rotation. The water flow to the blades at the top of the rotation may also be adversely effected by hull form and obstructions. Transverse thrust has the effect of trying to turn the vessel. A right handed propeller will ‘walk’ the stern of a vessel to starboard and the bow will swing to port when ahead power is applied. A helmsperson automatically corrects for this by applying a small amount of helm. In the same vessel when power astern is engaged the stern will ‘walk’ to port and the bow swings to starboard. Adjustments to the helm will not counteract this. Remember: The direction of ‘walk’ and bow swing will be the opposite for a left handed propeller. Transverse thrust is most noticeable when power is first applied to a vessel stopped in the water. It is more noticeable when going astern than ahead. 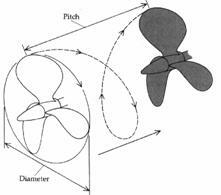 The effect of transverse thrust with a right handed propeller going ahead and astern. The propeller/gearbox combined with the available power will decide how the vessel will respond to the throttle. High speed vessels with a small diameter heavily pitched fast spinning propeller and vessels designed for towing with a large diameter moderately pitched slow spinning propeller will normally respond well to the throttle. Vessels designed to motor economically will normally react poorly to the throttle getting underway and stopping slowly. Always identify the propeller and rudder characteristics of your vessel. Every Master needs to appreciate the turning ability of their vessel, i.e. the distance it takes to turn and the time it takes to complete. Example: Proceeding at 6 knots apply 10° of starboard helm and complete a 360° turn (turning circle). • How far did the vessel advance and transfer before it was 90° off the original track? • How far are you displaced off your original track half way through the turn (known as tactical diameter)? • Complete the turn. Has your vessel turned inside the wake? Most probably yes. Reason: once the rudder is applied it has to overcome the vessel’s momentum before the turn commences. Every Master needs to appreciate the stopping ability of their vessel. It is normally measured in vessel lengths. It will depend on the vessel’s speed and manoeuvring characteristics (refer 3.1). Stopping can obviously be achieved by going astern, in an emergency maximum revolutions astern or even just place the throttle, at stop. Until the Master identifies the manoeuvring characteristics, the vessel may not be able proceed at a safe speed. By varying the rudder angle and speed you will start to appreciate your vessel’s turning ability. Before turning into a channel you can determine when to commence the turn to avoid overshooting the leads. This course discusses the handling characteristics of conventional power driven single screw vessels. Other forms of propulsion are available, each giving different handling characteristics. Many vessels designed for towing and fishing are fitted with a nozzle. A nozzle directs the axial thrust and effectively negates transverse thrust. A vessel with a fixed nozzle will have no transverse thrust and possibly poor steerage until power is applied. A steering nozzle has no transverse thrust and steers well ahead or astern but only when in gear. Outboard engines steer well ahead and astern when in gear with no effective steering in neutral. Twin outboards have some similar characteristics to twin screws. When manoeuvring outboard engines are very responsive to throttle movements. Jet boats draw water through a turbine and discharge via a moveable nozzle. Used especially in shallow waters and surf regions, as the propulsion system does not protrude below the hull. When in neutral the vessel will creep requiring constant adjustment to hold position. 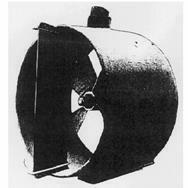 Controllable or Variable Pitch Propeller, as the name suggests the pitch of the propeller can be changed as required. The benefit of this type of propeller is that the engine need only turn the shaft in one direction and the ahead and astern thrust is altered as the pitch of the propeller is changed. Variations to a vessel’s speed are easy to make. Each unit can rotate through 360° and operate independently. A very manoeuvrable propulsion configuration used mainly on tugs. If you encounter a specialised propulsion unit you must learn its special characteristics and how to use them to advantage. In a twin engined vessel is the propellers are normally counter rotating, i.e. when going ahead both propellers are rotating outwards. That is, the starboard hand propeller is normally right handed and the port propeller left handed. Due to the configuration of the propellers it possible to turn a twin screw vessel around more easily than one with a single screw. To carry out this manoeuvre engage ahead on one engine and astern on the other. Then adjust the throttles, a few more revs are generally required on the astern engine to prevent headway (movement forward). This action would cause the vessel to abreast, i.e. on the spot. Whether going ahead or astern a twin screw vessel may be steered by adjusting the revolutions and/or gear of each propeller. When both engines are engaged either ahead or astern each negates the transverse effect of the other and the vessel should track straight. Transverse thrust still exists and can be used to advantage in vessel manoeuvring. You can estimate how you would expect a vessel to perform from a visual inspection, only with practice and experience will you get a feel for that particular vessels manoeuvring characteristics. For this reason it is essential to observe someone else while they are manoeuvring the vessel and also practice under the supervision of person who is familiar with the handling characteristics of that vessel. The hull and superstructure of all vessels act as a sail. The effect is most noticeable when beam on to the wind and a light displacement vessel with little wetted area is going to be effected more than a displacement vessel with large wetted area. This area exposed to the wind is known as the “windage area” and a large superstructure either forward or aft will effect handling by creating excessive windage in that area. The angle between the vessel’s head and its course through the water, attributed to the wind, is known as “leeway”. Leeway is commonly observed by noting the difference between the vessels’ wake and the course steered. The effect of the wind varies according to the windage area of the vessel and it is important for you as the master to be familiar with the effect of the wind on your vessel in various conditions of loading. Tidal streams and currents move a body of water in a particular direction. In a close manoeuvring situation, such as berthing or picking up a buoy, by approaching into (stemming) the tidal stream or current the vessel will have greater manoeuvrability at slow approach speeds (due the flow of water past the rudder) and a shorter stopping distance. 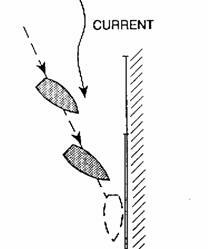 If the current or tidal stream is in the same direction as the approach the vessel will have poor steerage at slow approach speeds and increased stopping distances, with a resultant increase in transverse thrust. However, if the current is from abeam it would again cause problems preventing the vessel from coming alongside the berth or bringing the vessel alongside at an increased speed. Tidal streams in rivers and channels may reach up to 1½ knots at times. When in flood, greater rates are often experienced. This diagram indicates the typical path of the strongest stream in a winding river. Always be aware of the set, i.e. the direction the stream will push you. Always look at beacons, piles or buoys etc to estimate the set and rate of the tidal stream. Compare a similar vessel to your own at anchor and note which way it is resting, i.e. wind or tide rode. The wind and current will always have an effect on your vessel and it will need to be taken into consideration in all aspects of a voyage. Learn, where possible, to use them to your advantage especially when berthing, casting off, anchoring, picking up or leaving a buoy. The steering characteristics of displacement craft with fixed propellers and rudders and planing craft with outboard motors are vastly different. The effectiveness of a conventional rudder is determined by the water flowing over it, causing different pressures on either side. The stern moves toward the low pressure side causing the bow to move in the opposite direction. It follows that as we slow down your steering diminishes very rapidly. You have hardly any when out of gear and virtually none when going astern. 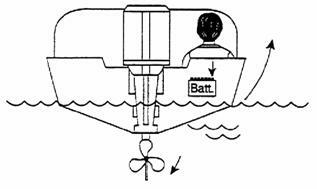 Astern power causes broken water to flow over your rudder and transverse thrust is likely to take over. It is worth noting here that in a turn it is the stern that moves first causing the bow to move in the opposite direction. If the stern can’t move the bow cannot respond. This is true of all boats, which means you must always be aware of what your stern is doing. Steering on an outboard or sterndrive powered boat depends mainly on the direction of thrust. Remembering that the propeller is behind the pivot point of the leg, it will either push or pull the stern of the boat where you point it. Although the leg is shaped something like a rudder and does assist, it is the thrust that does most of the work. Note that if you don’t have a forward steering position and are using the tiller arm on the motor, it is turned in the opposite direction to where you want to go. We don’t use transverse thrust with outboards and sterndrives to manoeuvre. It means a lot of helm work but just point the propeller where you want to go. · You will have virtually no steerage when out of gear which means your prop must be turning right up to the last moment of any manoeuvre. · Outboards have very poor stern power. However, as they steer as well astern as ahead, we can afford to go much slower. Before moving away from the jetty or beach there are a few things you should check. · Make sure your engine will start before ‘letting go’. · Check that your passengers are seated safely. · Check the stowage of all gear to make sure it doesn’t move about. · Have weight distributed evenly so you are not badly listed. If you know the vessel tends to ‘twist’ to port because of transverse thrust, you could start off listed a little to starboard. · Is your boat overloaded? Maintain plenty of freeboard. When all is ready, move off steadily being aware of other vessels and speed or wash restrictions. To get up on the plane, apply power steadily remembering the problems of cavitation and the boat rearing up. During this phase, weight distribution fore and aft is important. If you have too much weight forward, the nose will tend to bury itself and your boat won’t plane. If you have too much weight aft the nose will lift well out of the water and your boat will once again refuse to plane and pick up speed. Too much power in this situation can cause the back somersault problem. This is a common problem in light dinghies and inflatables when you are by yourself and driving from the stern. To get weight forward you sometimes need to extend the tiller arm of the motor to allow you to move forward. In this case remember you need to maintain positive throttle control! Once on the plane we can make the final adjustments to make things comfortable and get the best performance. Firstly, make sure you are riding on an even keel so that you have equal freeboard on both sides. If you have room, shifting people is probably the best way. In a small boat, they must not stand up as this upsets the stability of the vessel. In choppy conditions this could cause the boat to capsize. Secondly, we need to ‘trim’ the vessel lengthways. Many outboards and sterndrives are capable of being trimmed mechanically while you are moving along by changing the angle of the motor. On smaller motors this can be done by changing the pin in the adjusting holes in the mounting bracket. In this case it would be trial and error until you became familiar with your boat and the most common loading conditions. If the propeller is trimmed too far towards the transom it will drive the bow down into the water causing a wet bumpy ride. Danger: Taking excessive water over the bow. With the propeller too far back from the transom the bow will rise too far out of the water. The boat will tend to bounce over waves and be hard to steer. Danger: Bouncing over a larger wave and turning over. You will know when you have things ‘just right’. The ride will be comfortable and you will hear your engine performing at its best. In anything but the correct position you will lose engine rev’s and speed. trimmed correctly and not overloaded. · Don’t run your engine at maximum rev’s for extended periods. It usually means that you are wasting fuel with no significant gain in speed and at the same time not doing your engine any good. From throttle wide open, ease back slowly until you detect a slight drop in rev’s. This may cause an insignificant drop in speed, but all of the rest of the throttle you were using was wasted fuel. · Always adjust your speed to sea conditions, other boats in the area as well as hidden hazards. We all like the sensation of going fast but a wise skipper knows the relationship between speed and stopping distance. Experience will tell you what this distance is, but remember to try out each boat you drive in clear open water. They will all be different and you must know what to expect. A displacement hull will take longer to stop than a planing hull because of its weight. Care must be taken to approach things slowly to allow plenty of time to operate astern power, remembering the effect of transverse thrust. When a planing vessel is travelling at speed the hull is largely out of the water. A sudden reduction in power will cause the boat to settle into its displacement mode and stop very quickly. Great care must be taken because your stern wave will catch up with you and there is a danger of it swamping the boat and motor. At the very least, the stern wave will lift up your stern and push you forward and so it is not the time to be applying lots of astern power. Even in an emergency you can stop fairly quickly by a more gradual reduction of power allowing the boat to settle in the water and then applying astern power. Always remember to travel at a safe speed so you can anticipate dangers and stop in time. While the turning circle of a displacement vessel does not change with speed, the same is not true of a planing boat. Its turning circle depends on how much grip the hull can get on the water. When excessive helm is applied the boat tends to lean into the turn, but with no keel and choppy seas it can easily bounce and skate sideways across the surface. This is especially true if you are ‘bow up’ and trying to turn into a stiff breeze. In choppy water it is better to reduce speed and work the throttle to get the stern to dig in and give you some grip, even if you have to come off the plane to do it. When the stern does get a good grip the turn can be very severe and dangerous. It could cause the boat to capsize or throw someone overboard. in choppy seas. To turn sharply in any seas it is best to reduce speed first. If you need to turn very sharply (say 180°) in a confined space with your outboard and planing hull, there are two methods you can use. In a vessel up to about 6 metres if you have lots of powers try this: From stopped, turn the motor hard to port and positively apply full throttle for a short time. The bow will rise, the stern will dig in and the boat will tend to pivot sharply. Transverse thrust will help because you are going to port. You will cause some water disturbance so don’t do it if it will upset others. Also, be careful of the amount of power and don’t hold it on for too long! The idea is to turn, not pick up speed. Whether you turn to port or starboard first depends on transverse thrust (port first will help) or whether your motor turns further one way or the other. Try it out and go with the circumstances at the time. You may know that to turn ‘short around’ with fixed propellers and rudders on a displacement vessel we go ahead on one motor and astern on the other. This is because the propellers are fixed as to their direction of thrust and is especially effective if they are widely spaced. 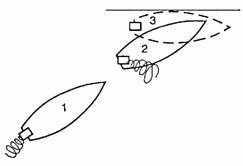 If we do this with twin outboards, because the direction of the thrust turns with the propellers, and because the propellers are usually close together, it tends to have the opposite effect and slow the turn down as they fight against each other as shown in the first diagram below. 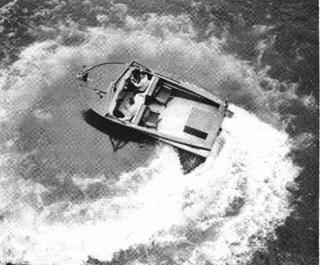 · Knowing your boat – its stopping and turning characteristics. · Being competent in the basics of handling your vessel. 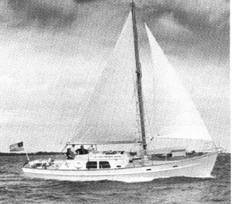 · Being prepared – having fenders and mooring lines ready and a clear plan in your mind. If you have crew, let them know what you intend and their role in the operation. We will confine our discussions from now on to planing boats with outboard motors. Don’t forget what we have already said about displacement hulls with fixed propellers and conventional rudders. They will behave very differently to our 5 metre centre consul with a 50 hp outboard. For the moment we will leave wind and current out of our procedure. For a 5 metre vessel, a head and stern line as shown may be sufficient. They will keep your vessel from moving out from the jetty especially if you take your stern line to the outside bollard. This gives extra length and a better angle. In some conditions these lines may not stop your boat from ‘ranging’ lengthways along the jetty. If this is the case we use spring lines. These not only solve our ranging problem but your forward spring is the most useful line when berthing and leaving the jetty. Note that your forward spring comes from the fore port of your boat and stops it from ranging forward. 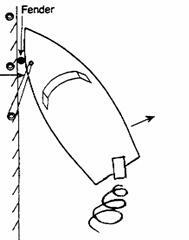 Your aft or back spring comes from the back of your boat and stops your boat from ranging backwards. One problem is that you seldom have enough cleats in the right places on a small boat to handle all of these lines. The other problem is they are usually so small that they can’t be used for two lines at a time or take more than one turn around them.. You will have to make do with what you have. Mooring lines should be of a suitable size for both strength and to allow a couple of turns on the cleats of your boat. Splice an eye on one end and melt the ends of the fibre on the other. They should be in good condition without knots or splices so they will run freely and not jam on obstructions on the jetty pile or bollard. They must be long enough to provide some ‘give’ as your boat moves gently, and to allow for any change in the tide. How you leave the jetty will depend on many variables such as wind, the size and weight of your boat, current and the extra pair of hands that a competent crew can give. Here are a few suggestions to start you off. What not to do: Don’t drop all of your lines and try to drive forward and away from the jetty. Remember it’s the stern that moves first and it will hit the jetty. Even worse it you are alongside an expensive large vessel! Use a headline: Shorten your headline up and rig it ‘on the bight’. This means you put the spliced end on your boat and run the line around the jetty bollard and back to the boat. After starting your engine, let go your other lines, and go astern with your propeller turned away from the jetty. Your headline will hold you while your stern is pulled away from the jetty. When angled up far enough, go back to neutral while the headline is let go and then reverse away. The friction of two wraps around the jetty bollard should allow you to hold the other end in your hand. When you let the tension off it will run clear and you can retrieve it from the front cleat when well clear of the jetty. 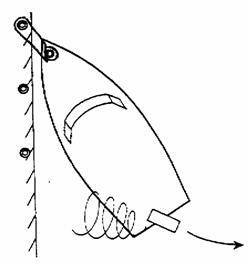 Use a forward spring: Rig your forward spring on the bight before letting go your other lines and go ahead at idle with your propeller away from the jetty. Your spring will stop you going forward and your boat will settle in alongside. (Your stern can’t move and so neither will your bow!) With the correct amount of rudder it will sit there quite happily while you take off your other lines. Holding alongside with forward spring. Remaining ahead at idle, turn your propeller toward the jetty and the stern will pivot away. At the desired angle, come to midships and reverse out letting the spring go at the same time. This would be the most common way to take our conventional displacement boat out as well! When backing out use a positive amount of power once your line is clear to stop wind and tide taking over. Remember the inefficiency of your propeller in astern, but also that you can steer quite efficiently. Now that we are away from the berth, how do we get back in? Try following the steps outlined below. You can adapt things for conditions later. · Prepare your mooring lines and check the jetty for a suitable bollard. · With outboards and stern drives you can berth equally well port or starboard side to. If by yourself, berth on the side of driving position. · Approach the jetty at an angle determined by the amount of room you have (ie. other boats on the jetty). · You should be in gear until the last moment to give you steerage but at a speed that will allow you to stop in time. · At the last moment, engage neutral, turn your propeller to the jetty and then apply astern power. This will stop your boat and pull your stern alongside. Depending on conditions and the number of helpers, you can then make yourself secure. If conditions are difficult or you are by yourself, you will need to use a spring. It will work from any near side cleat, but the shoulder one works best if you have one. If you haven’t, use the stern cleat as show below. Estimate the length you will require (about half the length of your boat) and tie if off to the cleat leaving the spliced end free. When you stop your boat, aim to have the driving position next to the bollard so you can drop the eye over it. Ease astern gently until the line is under tension and while staying in gear adjust the angle of your motor so your boat sits snugly alongside as it did when we were leaving. It will stay there while you put on the remaining lines. You can then come out of gear and shut your motor down. Using fenders can save your boat, and perhaps others in the area, in case of a ‘crash’ landing. Have them secured and ready before you berth. This is especially important if you are coming alongside another vessel. In this case, follow the same procedures as above. There will probably be people on the other boat to lend a hand. Anchoring is another routine task which shouldn’t present any difficulties but often does. The problems can arise from lack of knowledge, but more often from lack of planning and checking the simple things. Your anchor is also an essential part of your safety equipment and may well get you out of trouble one day. Let’s look at the basics of anchoring a small boat. Of the many types available, only a few are suitable for small boats. The C.Q.R. or plough, and the danforth are designed for sand and mud. The danforth is easier to stow because it lies flat. The plough is an excellent anchor best stowed hanging over the bow roller. 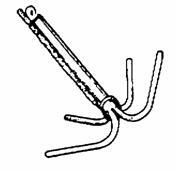 If you are anchoring in rock and reef, a reef pick is the best choice because the arms will bend if sufficient pressure is applied and it can be dragged free. It is sometimes impossible to free either of the other two in reef so take care. Losing your anchor can spoil a good day and may put you in danger later in the day if something else goes wrong. A sea anchor or drogue is also a handy piece of equipment in emergencies as we will see later. Your anchor must be large enough to hold you in poor conditions but at the same time be comfortably handled and stowed. Seek advice on size if you are not sure, but common sense and experience should tell you if the anchor you have is suitable. No anchor is suitable for all situations and so we need to choose the one which will do the job best according to the most common type of bottom we will be anchoring in. Anchor cable: You have two choices which will depend on your needs and the size of your boat. Chain is the best choice because it is strong, heavy and can be used in conjunction with the gypsy on your windlass if the size of your boat warrants one. The chain should be attached to your anchor with a shackle of the same size as the chain and the shackle should be moused (wire the pin to the body of the shackle) to prevent it from coming undone. Make sure that the inboard end of the chain (the bitter end) is secured to a strong point of your boat! Rope is commonly used as anchor cable on small boats. Choose a synthetic (man made fibre) rope as it is stronger and doesn’t rot. The size (diameter) should suit the weight and windage of your vessel. You should also have about four metres of chain shackled to your anchor and the rope shackled and moused to the chain through a thimble spliced into the rope. Once again – don’t forget to tie off the inboard end! The chain prevents chafing on the rope and provides weight to hold the shank of the anchor on the bottom. Most inexpensive synthetic ropes float and we will see how this would reduce the holding power of your anchor. The length will obviously depend on the depth of the water you intend anchoring in, but it should be at least four times the depth of the water. · The cable should be shackled to the anchor and secured at the bitter end to your boat. · If the anchor is stowed to prevent it falling over the side in choppy seas it should be easy to detach. · Cable should be coiled or flaked so that it will run out easily without tangling. As you can imagine, it is impossible for a weight that you can comfortably lift to hold a boat a great many time its own weight against wind and wave action. You can see how the weight of chain helps and how the length of the cable compared to the depth of water (scope) is vital to keep the cable pulling horizontally. In the diagram above you can see that your cable develops a curve. Chain will naturally do this and you can secure a weight on a rope cable to get the same effect. As your boat moves, most of the work is being done by the cable being lifted and pulled through the water before the weight goes onto the anchor. A constant steady pull which straightens your cable must pull the anchor out. You should notice your cable continuously straightening and then curving which means your boat is ‘riding at anchor’. · Is the anchor ready to let go? · Am I anchoring in sand, mud, shale or rock and is my anchor suitable? Shale has poor holding power and beware of rock and reef. · What is the depth of water – do I have sufficient cable and is there enough water to allow for tidal movement? 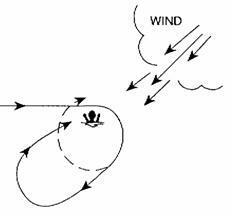 · If the wind changes, do I have swing room and would it put me in danger of being blown onshore if my anchor drags? · Are there other boats in the area that could cause problems? · Stop your boat and let go the anchor. · Allow your boat to drift back as you play out the desired amount of cable. Don’t let your chain pile up on top of your anchor. · Secure the cable. You should feel the anchor grip and bring your bow into the wind or current. · If it is not holding your cable will be straight and if you put your hand on it, you will feel the anchor dragging over the bottom. · Periodically check your position relative to other vessels or land marks. · If using rope cable, make sure it is not chafing where it goes over the bow. Remember, your anchor is only intended as a temporary mooring. No anchor will hold indefinitely as conditions change and so it follows that someone should be on board to continually check your position and take further action as required. When anchoring in reef, especially coral reef, be aware of the damage your anchor and chain does. Try and anchor in sand to windward and hang back onto the reef. This will prevent damage and ensure you can retrieve your anchor when it is time to go. · Always start your motor before you haul the anchor. · Drive forward to take the strain off the windlass as you are retrieving the cable keeping your bow into the wind..
· Stow cable and anchor securely ready for emergency use. Larger vessels, due to their size, hull form and power are not as manoeuvrable as smaller vessels. Stopping distances are increased by the huge momentum of a large vessel, turning circles are large and response to the helm relatively slow. All these factors make it harder for a larger vessel to make swift and nimble manoeuvres as can be made by most small vessels. In light of the above, the navigator on a small vessel must bear in mind these constraints on a larger vessel before impeding its’ path or passing so close so as to not allow any margin for error or the manoeuvring characteristics of the larger vessel. Depending on the position of the accommodation on a large vessel it may have large areas forward of the bow that are unsighted. In these areas if a small vessel approaches so close, the watchkeeper of the larger vessel will lose sight of the smaller vessel for a considerable length of time. This is extremely dangerous as the watchkeeper may assume that the smaller vessel will pass clear under the bow. If there is any alteration of speed of the smaller crossing vessel, it would result in a collision and the small vessel being lost. On the other hand, if the watch keeper of the larger vessel tries to manoeuvre to keep clear, it could result in contact with the smaller vessel. It is therefore essential when operating around larger vessels to give them a wide berth and always be in sight of their watchkeeping position. Well before the vessel is due to berth, anchor or conduct any evolution the crew must be fully briefed. The term, “turning a vessel short round”, basically means to turn a vessel in the minimum possible space. If your vessel has a single right hand turning propeller it will turn short round easier to starboard. See Fig 3.14. • Start the turn from the port side of the river (1). • Wheel hard to starboard, give a quick burst ahead. Do not gather too much headway. Stop engine (2). • Wheel hard to starboard, use engine to complete the turn (4). The transverse thrust of the initial, forward, burst of power is trying to turn us to port. This is more than overcome by the turning effect of the rudder as water is pumped over it. The vessel will start to turn to starboard before it begins making way. The transverse thrust from the burst of astern continues the turning motion of the bow to starboard whilst the rudder is amidships. In good conditions most vessels can be turned short round in two boat lengths. 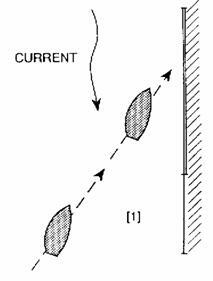 Currents, tidal streams and strong wind will adversely effect the manoeuvre particularly when beam on turning into the wind. The bow line runs through the fairlead. The stern line runs through the after fairlead. These lines should be run well along the wharf or berth and hold the vessel in. Breast lines may be run perpendicular from the bow, midship or quarter to keep the vessel from moving away from the wharf or berth. Spring lines run from the bow and stern to stop ranging, (fore and aft movement of the vessel). When securing alongside attention must be paid to the range of the tide, at high tide leave enough slack to ensure the lines do not part as the tide falls. Mooring lines should be checked at each turn of the tide. Use only lines with eyes spliced onto the shore end so the line can be tended on board. Avoid sharp bends in the mooring lines where they pass through fairlead or chocks, use some form of anti-chafing gear around the bends. There are many forms of fittings for this purpose, on large vessels the most common are bitts (bollards), in smaller vessels we use cleats, stag horn bollards or sampson posts, in all cases first take two full turns of the line around the base before the line is secured with figure eights. Refer to Fig 3.27. If two bights or eye splices are to be placed over the same bollard, the second should lead up through the eye of the first so that either can be removed independently. Never try to hold a vessel without taking turns of the line around the fitting. Stand well back out of the bight of the line and at 90° to the angle of pull. Learn how to use the spring lines, bow or stern, for manoeuvring the vessel in and out of tight spaces. They can be used to spring a vessel onto or off a wharf or berth, to clear other vessel or when being warped around the end of the berth. Mooring lines should be checked frequently for signs of wear or fatigue. When not in use lines should be correctly stowed and protected from the weather and direct sunlight. Unless there are very pressing reasons such as wind, tide, or berthing space, a vessel should always be berthed taking advantage of transverse thrust. That is, port side to for a single screw vessel with a right handed propeller. Starboard side approach and bring the craft neatly alongside. See sketch port side approach. Look at the same approach for a vessel berthing starboard side to. When astern power is applied the stern swings away from the wharf. Solution: Shallow approach 10-15°, when in position apply full port rudder and kick astern to check headway and swing. Even with no wind or tide, berthing starboard side to is difficult and requires extra caution. Tidal stream, if possible always stem the stream. Equally difficult is to come into a berth travelling in the same direction as a strong tidal stream or current. If this is attempted the engine driving astern has to take off the way of the vessel and provide speed astern through the water equal to the tide or current. The craft should be turned to approach the berth stemming the tide or current. If this is not possible mooring ropes may be required to hold the bow to the berth as you turn the rudder away from the berth and give the engine a short sharp burst ahead. This will cause the stern to pushed towards the berth while the bow is kept in position by the mooring rope. It is difficult, if not dangerous, to try to berth on the weather side of a jetty or pontoon if the wind is strong. Under these conditions it is desirable to seek a berth on the lee side. When berthing alongside floating objects; if the object is bigger go to the leeward side; if smaller go to windward. Remember: If your approach is misjudged, abort the attempt. It is better to have a dent in your pride then in your vessel. • Plan your approach to the anchorage by heading into the wind or the tidal stream (which ever is strongest). • Manoeuvre as required to the intended position. If your vessel does not develop a slight sternway, give a short burst astern. In a twin screw vessel normally one engine is sufficient. • Let go the anchor. Let the cable run out freely until it reaches the bottom. • Ensure the vessel has slight sternway to ensure the cable is being laid, not piled up. Refer to Fig 3.15. Beware of gathering too much sternway, the cable must always be under control. When the final length of cable has been deployed secure the brake. • Watch the cable as the vessel is “brought up” (has its cable). This is a critical stage, because as the cable takes the weight of the vessel it is important to observe the cable. If the anchor cable shudders or goes slack and tightens again it indicates that the anchor has dragged on the bottom. The cable should go taught and then slack again in a smooth fashion indicating that the anchor has held. • Watch the cable for a couple of minutes to ensure that the anchor does not drag. A small amount of stern power may be required to ensure that the anchor has ‘set’. • You can expect it to be more secure than any anchor. A standard mooring buoy has a large eye at the top to which you may secure your mooring line as described below. However, many smaller moorings have a securing warp permanently shackled to the buoy or mooring chain. The procedure outlined below is to moor to a standard buoy, if you moor to a smaller buoy, the approach to the buoy remains the same. The main difference being you can reach the warp with a boat hook or similar device and then drop it over the bitts. The first step in mooring to a standard buoy is to put a person (with a life jacket on) onto the buoy, this will normally mean putting the dinghy in the water or bring the vessel alongside the buoy and put the person across. You can now approach the buoy slowly whilst stemming the wind or tidal stream (which ever is strongest), keeping it fine on the starboard bow. When alongside going astern the transverse thrust will pay the bow off towards the buoy. While you hold the vessel in position pay out picking up rope, one end of which is secured on the forward bitts. This picking up rope is passed through the eye of the buoy and back on board where it is secured. This rope will now hold you close to the buoy while you pass out and secure the mooring line that will be shackled to the buoy. Don’t forget to retrieve the person off the buoy. The vessel can now be allowed to fall back onto the mooring line by easing off the picking up rope. (The picking up rope should be left in place if your stay is not long as you will use it in getting away from the buoy. Allow it to lie completely slack). To leave the buoy the reverse of the mooring procedure must be adopted. The vessel is about to proceed and is lying back on her mooring line that is shackled to the ring of the buoy. Put a person on the buoy and if the pick up rope was removed, pass the pick-up rope or wire exactly as you did when tying up to the buoy. Bring the vessel close up to the buoy so that the weight is taken off the mooring line. You can do this with the engine or by taking the weight on the picking up rope. With weight now taken off the main mooring line it can easily be unshackled by the person on the buoy. Retrieve the person off the buoy. Let go of the picking up rope. As the vessel moves astern the picking up rope will be drawn through the eye of the buoy and clear of it allowing the vessel to proceed out of the mooring. The motion of a vessel causes an increase in water pressure at the bow and stern and a reduction in pressure amidships. Interaction occurs when the normal flow of water around the hull is restricted by the influence of shallow water, a breakwater, dredged channel or by the close passage of another vessel. To reduce the effects of squat reduce your vessel’s speed. When entering shallow water you may notice the bow and stern waves move forward and also experience excessive vibration. When operating in proximity of breakwaters, dredged channels or banks allowances need to be made for the effects of Interaction. The bow and stern of the vessel will be repelled whilst the body of the vessel will be attracted to the obstruction. This creates little problem if the obstruction is continuous and you can travel in the middle of the channel created, all the forces balance. If it is not continuous or you must travel on one side there is a tendency for the bow to sheer, i.e. pushed away from the closest bank, and you will need to compensate for this effect by reducing speed and carrying helm (wheel). The pressure fields of two vessels in close proximity on the same or opposite headings will Interact and require corrective action to maintain course. The large suction zone around the longer of the two vessels may be the dominating factor in Interaction between vessels of significantly different size. This may present a very dangerous situation for the smaller vessel, particularly if it is overtaking. Factors that increase the risk of interaction are, high speed, large size vessel, narrow channel and shallow water. The pressure waves that create Interaction are proportional to the square of the vessel speed, thus the effects of all forms of interaction can be instantly reduced by reducing speed. In some cases consideration will have to be given to the loss of steering control associated with speed reduction. The sketch above shows the reaction of vessel ‘B’ as it is overtaken by vessel ‘A’. Overtaking vessels should avoid passing too close in open waters when there is room to manoeuvre, and be particularly cautious in narrow channels when overtaking or being overtaken. and at times, this can produce uncomfortable and dangerous conditions for a small boat. Are caused by the direct local action of the wind. As the wind gets to about 8-10 knots the crests of the waves steepen until they become unstable and break producing white caps. The strength of the wind, the length of time it has been blowing and the uninterrupted distance it blows over will determine the size of the waves. This distance is called ‘fetch’. We measure waves as in Figure 1.36b below. Is a more regular wave motion caused by a large disturbance (like a storm), sometimes quite some distance away. It will continue after the disturbance has gone and can travel for long distances in deep water. By itself, swell is usually not dangerous until it moves into shallower water where the energy ‘spills’ out of the crests causing heavy breaks. This happens near sand bars, reef and along the coast. If encountering heavy weather and rough seas is unavoidable, it should be remembered that rough seas not only make the vessel uncomfortable, but can also cause extreme structural damage; often the first and most convenient action is to slow down the vessel’s speed or change course, particularly if the seas are on the stern or quarter. Taking a big sea head on, or a point or two off the bow results in the safest way of handling the situation. Unpredictable high waves and dangerous conditions can be caused by seawaves on top of a heavy swell especially when there is a change in the depth of water. Wave hight may be 40% higher than predicted by the BOM. It is vital to know the performance capabilities and limitations of your boat before venturing out into the open sea. It is even more vital to know your capabilities and to be aware of the dangers of rough seas. Speed through the water is the actual speed that your boat is being propelled through the water by our engine. point to another which is a combination of our engine speed and the speed of the current. Consider the following examples. You wish to berth in a tidal stream of 2 knots. If you berth with the tide, maintaining a speed of two knots through the water to give us steerage, we are actually approaching the jetty at a speed of four knots over the ground. To actually be stationary alongside the jetty to get your lines on you have to be going astern at two knots! If you stem the tide, while stationary alongside you are still moving forward through the water at two knots to counteract the current. This helps your control with an outboard motor and is essential with a fixed propeller and rudder. You will go further into this at Coxswain level and above, but for the moment the golden rule is: approach your berth, your mooring or your anchorage into the current if at all possible, while still being aware of the wind. When berthing or making landfall, the current will take you off your intended track just as wind will. In the figure below to follow desired path we need to steer into the current. Coming into a port with a narrow opening and dangers either side presents the same problems. To ensure we stay on our intended track we use transits. This means that we keep two marks in line, regardless of our ship’s head, as shown below. · Don’t be there! Never go to sea if there is any doubt and if conditions deteriorate, go back to port or seek shelter. · Watch your speed – don’t go too fast and adjust to minimise the amount of water coming on board. · Take great care turning in seas. Even in slight seas, slow down. 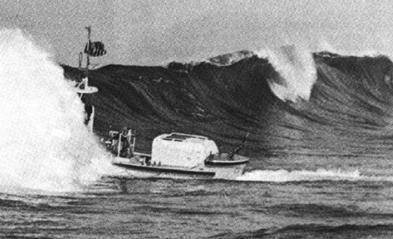 · Keep a good look out for the ‘big’ wave for if your boat becomes swamped you are totally at the mercy of the elements. · Keep your bilge pump working or that bucket handy so you can keep your boat as dry as possible. · Prepare life saving gear, and get passengers into life jackets. When manoeuvring in protected water, wind still causes problems. 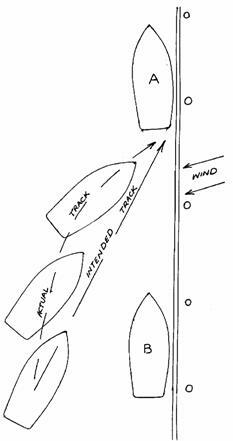 It effects all boats differently depending on their weight, draft, windage and the angle the wind is coming from in relation to our course. Our small boat is light and has little draft and so a fresh wind can cause some handling problems. Remember also that the slower we go, the more time the wind has to work on us, but as sometimes we have to go slow, allowances need to be made. Berthing is one such situation. When making your approach to a jetty you can either end up ‘short’ of your berth or too far off the jetty to get your first line (spring) on, depending on the direction of the wind. Regardless of where our bow is pointing we must always be aware of the track or path our boat is following. Below, we have a 20 knot onshore wind and we wish to berth between two other vessels. By watching our boats head and not the track we are actually following, we will follow the curved path shown and may get too close to vessel B. If we leave it too late, when we turn hard to port causing our stern to move to starboard we are in danger of making contact. The next figure shows that we will be blown further away from the jetty and our final approach will be too steep. Being almost bow on will make it difficult to secure ourselves alongside. Coming to anchor and picking up a mooring are other manoeuvres where wind can play a part. Be aware of it and anticipate the effect. Use it to your own advantage if you can. Unless there is a strong current manoeuvring into the wind gives us better control because there is less windage and we can approach more slowly. Ideally a vessel at sea should avoid heavy weather conditions, this is often not possible. If adverse weather is expected or encountered action should be taken to ensure the safety of the vessel, passengers and crew. A prudent Master should be aware of the vessel’s sea handling ability, knowledge of the vessel’s stability, how to handle the vessel in adverse weather conditions and steps to take to prepare the vessel for heavy weather. • The anchor gear to see that the anchor is secured, the stopper fitted, winch brake on, spurling pipe and any other openings made watertight. • Heavy objects or cargo that could be safely stowed below decks should be shifted. • Deck cleared of any loose debris or equipment. All equipment on deck is made secure. • All watertight doors, hatch covers and openings to below deck secured and water tight. • Freeing ports and scuppers checked to see they are free and working and a deck life line rigged. • Bilges should be pumped, and any tanks, if possible, either emptied or pressed up to reduce loss of stability through “free surface” effect. • Engine, steering gear. Perform routine checks and maintenance. • Life saving and fire fighting appliances. Have flares, grab bag and lifejackets on hand. • Put position on chart and report to a shore station with a radio check. • Have a meal and prepare simple food for later. Running before heavy seas is dangerous because the hull is lifted by stern and you can lose steerage and power often leading to a situation where the vessel may commence to surf down a wave and “broach” or even capsize. Also when running before heavy seas there is the possibility of the vessel being “pooped” or swamped by a following sea, which can lead to broaching or capsizing. 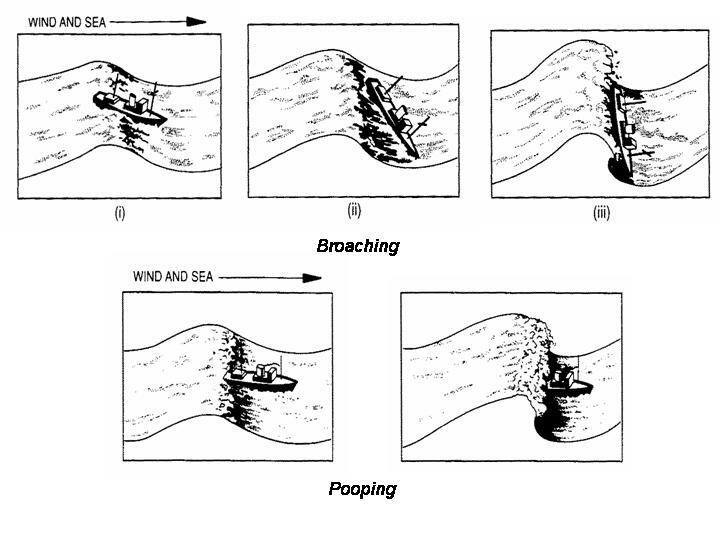 To avoid broaching and pooping, reduce your vessel’s speed to 1/3 of the waves speed. When the sea is on the bow, the vessel rolls and pitches simultaneously, and the resistance of the vessel’s headway reduces the angle of roll. When the vessel runs with the sea however, the roll increases because there is less resistance forward, and the wave runs past the vessel more slowly and stays in contact longer. The result is a pronounced roll and pitch and the possibility of heavy seas being taken over the stern. Because the sea is traversing the vessel from astern, the rudder is less effective, and the vessel may be slewed across the waves and broach. The added weight of water from boarding seas can produce the danger of a capsize. To avoid excessive strain on the hull and impact from waves taken over the bow, reduce speed and alter course placing the sea just off the bow. When a vessel is beam on to a sea it rolls heavily. When the period of encounter approaches synchronisation with the period of roll, the vessel’s motion will be violent. To avoid synchronisation alter course and speed to change the period of encounter. Do it before it is necessary, for example, before the vessel finds itself in jeopardy off a lee shore. Turn in a smooth, a period when the waves are momentarily flatter than the prevailing sea condition. Start the manoeuvre as soon as the wave crest has passed the vessel (1). Reduce engine speed to allow the sea to pass quickly. Turn the wheel hard over and turn the vessel in the trough between the crests. Try to turn fast enough so you are head-to the next wave. Apply power to complete the turn quickly but don’t gather too much headway (2). Reduce speed as soon as the vessel is nearly head-to-weather (3). Spreading oil from astern may assist. Don’t turn when there is water on deck. Prudence dictates turning well before damage or loss of stability dictates. A stern trawler with a ramp may have to turn to weather before other vessel types because the sea will run up the ramp and break on the deck. High bulwarks ordinarily make it comfortable to work, but become a water trap in these conditions. Freeing ports must be kept clear. Taking the seas on the port or starboard bow lessens some of the pitch (1). At the right speed, going to weather is safer than having the weather abeam or astern. When the conditions warrant, reduce speed and let the swells roll by, or even use a drogue or sea anchor (2). Avoid the trough except in an emergency. 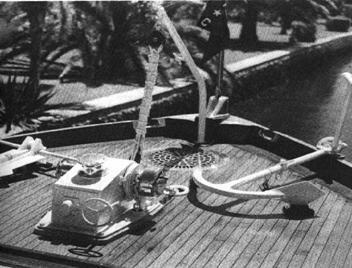 When you are moving broadside to the waves, turn the wheel momentarily to take larger crests on the windward bow, then return to course when conditions permit (3). When the conditions become unmanageable and the weather is deteriorating a vessel should ‘hove-to’ and avoids risking damage to the vessel and further endangering the crew and passengers. To heave to a vessel should reduce speed to maintain steerage way with the sea either on the bow or on the quarter. In the extreme situation of being unable to control the vessel, stop engines and drift with a sea anchor until the conditions improve. The sea anchor or drogue can be deployed in many situations, for example, in deep water where the conventional anchor is impractical. It can be used to slow the progression of the vessel in a distress situation, or when a vessel is being driven faster than the wave train in a following sea. When streamed from the bow in heavy weather (heaved to) it will keep the bow into the wind and waves, easing the stress on the vessel and creating a degree of comfort for those on board. In the situation of a sea anchor being needed, but one not being available, suitable substitutes can be created using such material as: bundles of nets or bags, berthing lines or short lengths of wood, tied in such a way it can be deployed to retard the vessel’s progression. The sea anchor when deployed from the vessel’s bow or stern should have enough scope so that the vessel and the sea anchor will not be on subsequent wave crests at the same time. (Fig 3.23 below). A bar is an accumulation of sand or silt at the entrance of a river or a lake. The build up could occur due to a current running across the mouth of the river or entrance of the lake, depositing sand across it. Also, rivers can deposit silt at their mouths where they meet the sea. Bars cause the waves to get steeper and in some cases break as they get to the bar. For this reason it is important to take a number of precautions and manoeuvre the vessel with extreme caution over a bar. Crossing bars should be avoided if the wind and waves are in opposition as may occur during strong land breezes or offshore winds, rough weather or ebb tides. If you intend to cross the bar for the first time or even one that you are familiar with, ensure that you check with the local Royal Volunteer Coastal Patrol or Harbour Master. They will be able to give you the latest condition report, additional information regarding the safest passage over the bar, the peculiarities of it and the best crossing time. Always check the tides and weather report. The answer is with great care ……! because once started you are committed to crossing the bar. • State of tide, always cross with incoming tide. • Always wear life jackets. • Ensure all loose gear is stored and secured. • If any, trim slightly by the stern. • Keep everyone sitting and still. • Before approaching the bar test engines (both ahead or astern), steering and draw fuel from a full tank. • While approaching the bar keep a close lookout for depth of water, smallest waves, where the breakers are, etc. The preferable time to cross a bar is at the high tide, or during the first of the run in. The worst is at low tide and half way through the ebb tide, or with rivers experiencing flooding. If possible observe the bar from a high headland for at least twenty minutes to see if a regular set of larger swells is running. Take note of the interval, because if you do not want to have to encounter those larger swells, your vessel must be capable of crossing over during the time of the lull. · Approach the surf zone and look for a lull. · Power to the first wave and ease off over the crest to prevent becoming air borne. · Repeat this process until clear, looking for the lowest part of each wave. · If there are leads marking the channel they will be behind you, you may need someone talking you through so you can keep your eyes ahead. · Don’t hesitate to work your throttle to keep your bow into the sea. · You may ship a little water but if you take it steady all should be well. • Motor slowly to the breaking waves looking for the area where the waves break last or even better, not at all. Wait for a flatter than usual stretch of water and motor through. • If there seems no respite in the waves slowly power through each oncoming wave ensuring that you are not going too fast over each wave. In a light craft this would result in becoming airborne and lead to swamping on landing, or in a larger craft would cause the vessel to “bottom out” if it pitches heavily. • In light conditions, make the crossing with the waves slightly on the bow so that the vessel gently rolls over the crest of each wave. If you do have to encounter large swells or white water, ensure the vessels head is dead on, to avoid broaching and a consequent roll and capsize. The shoals of a bar rise steeply at the outer face, and from at sea the tell tale white water can be hidden on the shoreward side of the swells. When approaching the bar keep a good lookout for changes in the water colour, the bluer the water, the deeper it is. Breakers that are steeper at one section of the wave front indicate shallow water. Never anchor near the edge of a bar or a rogue swell may surprise you. If possible observe the bar from a safe position offshore for at least twenty minutes to see if a regular set of larger swells is running. Take note of the interval, because you need to enter on the back of the last of the set of larger swells. Approaching from sea, increase power of the vessel to catch up behind the last of the bigger set of waves and position the vessel on the back of the wave (ensure the vessel does not “surf” down the face of the wave). · Identify a compass course or high shore feature as a steering mark for when the swell builds up in front of you and you are steering blind. · Your boat must be capable of more speed than the waves (20 – 30 kts). · If you slow down there is a danger that the wave behind will ‘poop’ you. If swamped you will slow even further, lose steerage and be at the mercy of the breakers. · Don’t go over the wave you are on. You will surf and once again steerage will be lost and you could bury your nose into the wave in front or loose steerage and turn side on to the waves and roll over (broaching). · If there is insufficient depth of water and you touch bottom, all of the above apply and you are in serious trouble. Ensure there is insufficient depth of water. Prepare your vessel and passengers as you would for heavy weather to address watertight integrity, trim and safety gear (close openings, trim by the stern and wear lifejackets). Use your most competent helmsman. Approaching from sea, increase power of the vessel to catch up behind the last of the bigger set of waves and position the vessel on the back of the wave (ensure the vessel does not “surf” down the face of the wave). Your vessel is unlikely to attain the swell speed (20 – 30 kts) so waves will overtake you during your crossing of a significant river bar. · Steer directly with the waves and be ready to counteract the potential broach by timely helm and power thrusts. · Do not attempt to turn around on the bar itself. Beaching your boat in surf presents the same risks as crossing a bar. Unless in an emergency situation you should never beach a boat that the occupants can’t physically man handle and drag up the beach. Unlike crossing a bar, you don’t have deep calm water at the end of the manoeuvre so you must get your boat away from the breakers. For the above reasons, the beach should neither be rocky or too steep. Tell your passengers the plan and don’t try it if you have any doubts. You risk personal injury and damage to your boat and motor. By now you must realise that the dangers are being pooped (swamped) or broached (turning over because you got beam onto the waves). Both of these are likely if you touch bottom, and you have to sooner or later! · Just before you get into the breaks, put your bow into the sea and prepare your oars. · You can either row in backwards from there or use your motor for part of the way. 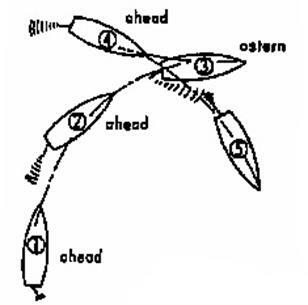 · You must tilt your motor before it touches the bottom or the bow will rise up and you will end up beam on. · Just before or as your stern touches, everyone out and pull like mad! To help keep your bow into the sea you can use your anchor. Drop it when you turn just outside the breakers and keep some tension on the cable as you feed it out. The oars are used to help manoeuvre you in as the wave action will do most of the work anyway. The anchor will be most useful when you are leaving by once again keeping your nose into the sea. Confined water can mean many situations including channels, rivers, anchorages, harbours and in or near reef and shallow water. In any of these situations, the most important factors are speed and keeping a lookout. We must have ample warning and be able to stop in time to avoid dangers. The wake of your boat at speed is a danger and a source of annoyance to other vessels. Most confined water is speed restricted, so obey the limits. We can only look at some of the problems you may come across in confined water. It is up to you to use common sense and caution. Channels are used to show boats the safest passage through dangers or shallow water and would generally be marked. We will go into the rules and markings in the next section. They are used by a variety of boats and can be quite busy. Watch your speed and don’t get too close to other vessels, especially large ones. They are not as manoeuvrable as you, so keep out of their way! Busy harbours present similar problems including lots of traffic, large vessels berthing or unberthing with tugs, and crossing ferries. Keep your speed down and keep as far away from other boats as you can. · Keep to starboard and slow down around bends where visibility is restricted. · Water clarity is usually poor, hiding snags and fallen trees especially near the banks. · The water will be deepest on the outside of bends where it travels faster. Sand and mud bars build up on the inside where the water slows down. · After heavy rain there will be strong currents and debris running down stream. Keep a good eye out for logs and other rubbish. Reef can be encountered at any time and so some local knowledge is important. If you have none, ask the locals and study a chart of the area. Keep speed down unless you are sure that you have plenty of water around and under you. Reef comes up quickly and is very very hard! · Change in colour of the water. · Waves breaking more heavily or in a different pattern. · In ‘glassy’ conditions the water will lump up over shallow parts. Use polaroid sunglasses. They make it easier to pick colour change and see into the water. · Use of ‘reef pick’ rather than a danforth or plough anchor. · Be wary of anchoring on the windward side in case your anchor doesn’t hold – never if you have a motor that is hard to start or if the seas are heavy. · Watch out for that larger than usual wave even if you are on the lee side of the reef. They can break right over the top! It would be nice to think that we would never have to face an emergency situation. With proper planning, preparation and skill this may well be the case, but there is always that ‘other bloke’! Having thought about possible problems and decided on a plan of action may help you ‘think on your feet’ and save the day. When you take on the roll of skipper you take on total responsibility for your boat and passengers. · Holing your boat seriously and sinking. · Colliding with another vessel or person in the water. · A major fire on board. · Being swamped or capsized in heavy seas. These are life threatening situations and would all indicate a failure on your part to take proper care. You had better hope that your pre-departure planning was better than your execution because you need HELP! We are not going to discuss these situations in detail as our studies so far have been directed toward avoiding such things. Please remember to be safety conscious at all times. Let’s look at some less tragic situations that you may encounter and should be able to handle. Engine breakdowns are something that happens to us all over time but can minimised if we take the care necessary to keep our motor in good working order. Regular maintenance can make the difference between a good day out and a disaster. Engines usually give you warning that problems are developing, by being hard to start, running roughly etc. We don’t go to sea unless to the best of our knowledge we are going to make it home again. Let’s assume we have done all of the right things, are out at sea and we strike problems. What could be the problem and what can we do about it? · In any situation where you lose power your first job is to get back into control. Where am I, how deep is the water, am I in danger of drifting onto a reef or the beach? Anchor up if you need to and you are back under control. You can then turn your mind to the problem knowing that you and your passengers are safe – temporarily at least. If the water is too deep to anchor but you can drift safely and gently while you turn you attention to the problem, your luck is in. In choppy conditions, put out your sea anchor or a line with anything that produces drag attached, in order to keep your bow into the wind. Use your imagination if you don’t carry a sea anchor. What else could you use? What are the most likely problems? A small boat without gauges to indicate fuel levels and temperature means you have to keep your eye on things constantly. · Check your fuel. Do you need to change tanks? Has a connection come loose? We are assuming that you were carrying enough for your planned journey! No fuel means no hope. · Have you been constantly checking your ‘tell tale’ to ensure you have cooling water circulating? Come out of gear and double check your ‘tell tale’. You may have weed or a plastic bag over your intake. Shut down and check. If this is not the problem you may have water pump problems. Your ‘tell tale’ may be blocked with corrosion, but after restarting at idle you should get turbulence from your main outlet near the propeller. No turbulence, no ‘tell tale’, no hope! Don’t destroy your motor, if you haven’t already, by running it without cooling water. · Long periods at idle speed can cause your engine to stall due to a build up of oil on the spark plugs. If you are trolling and your motor starts to run roughly, go into neutral and put on some revs for a short while. If your motor won’t start after stalling, take out your spark plugs and dry them off. Give them a wipe with a rag and a good blow! · The ignition (spark producing) system on a modern outboard is contained in a closed circuit ‘black box’. If you are sure you have fuel and the plugs are clean, with all connections OK, check to see if you are getting ‘spark’ by taking out a spark plug, earthing it to the body of the motor and turning over your engine. You should see a ‘spark’ at the tip of your plug. Check all of your plugs to make sure it wasn’t just one plug faulty although this would have produced a ‘miss’ in your engine rather than causing it to shut down all together. · Propellers can cause their share of problems. Always check before departure that it is on securely and that the locking device is keeping the nut from working loose. The rubber bush should show no signs of deterioration and the blades should not be bent or badly chipped. At sea your propeller can be fouled with weed or rope. Your engine may labour or the propeller starts to cavitate. It is a simple matter to raise the leg and clear it. A damaged propeller should get you home if you take it slowly. A lost propeller won’t! · Batteries must be kept in good condition and fully charged. If you have minor problems and you have to crank your motor over for some time, a defective battery will go flat very quickly. If going offshore it is a good idea to take your car battery as a spare. Carry a basic set of tools including screw drivers (two types), a plug spanner, pliers and a couple of shifters of suitable size. If working over the side of the boat on your engine, don’t drop anything! If going offshore, spare spark plugs and a spare propeller, nut and washer are a good idea. in distress, the occasion may arise for you to provide a tow or be towed. Remember by law the only time you can refuse to give assistance is if it is impractical or places your vessel or crew in danger. In all other cases, to avoid any legal complications, before providing a tow or being towed, determine with the other party, a place of safety to be towed to, and payment, if any. • Does the exercise endanger your vessel or crew. • Duration of the voyage. • Whether you have sufficient fuel allowing for the additional drag. • The effect of the delay to your own vessel. • The power of your engines. • Notify the owners and insurers of your vessel. • Enter into a Lloyd’s Open form of Salvage agreement, if appropriate. In the event of being towed or towing, establish contact with the other vessel and establish who can supply the strongest and most efficient towing gear, preferably rigged as shown in the sketch. When the most efficient towing arrangement is rigged, the next thing is to pass over the tow, this may call for a degree of thought with particular emphasis on safety. The circumstances and weather conditions may govern this, it may be as simple as coming alongside the other vessel or as complicated as floating or transferring a messenger line prior to connecting the tow. During the tow contact must be maintained either by radio or prearranged signals and a visual watch should be kept on the tow. Remember the vessel being towed is in charge. The appropriate lights and shapes required by the collision regulations should be displayed if possible. Towing is dangerous. Keep all personnel well clear. • Ensure the towing line is not chafing. • Freshen the nip, i.e. pay out the tow line to reduce chafing. • Grease the line at the point of contact with the vessel. 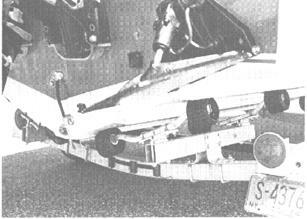 • Ensure that the tow line can be released in an emergency under all conditions of load. • If the towed vessel is manned use its steering gear. • Trim it by stern by transferring weights. • Alter course and/or speed. • Increasing speed tends to correct a yaw directly caused by list. • Decreasing speed tends to correct a yaw produced by adverse trim. • Set the towed vessel’s rudder at an angle to counteract the sheer. Remember when commencing the tow increase speed slowly and monitor the tow line, the towed vessel and your own vessel’s performance. It is possible to assist a vessel in sheltered or confined waters, by simply coming alongside the other vessel and making fast with bow, stern and spring lines. The two vessels must be positioned so that the propulsion and steering gear of the assisting vessel are well aft of the other vessel and in clear water, in this manner even larger vessels can be assisted and manoeuvred. Using this method of towing in confined waters gives the towing vessel better control over the tow. · Bring your motor back to idle. With the reduction in power the boat will come off the plane and settle into the water. This will take off most of your way. · Your stern wave will catch up with you causing your stern to lift and your boat to move forward on the wave. · From idle forward engage astern and apply sufficient throttle to complete your stop without excessive cavitation. · When ‘dead’ in the water, come into neutral. · Your stern wave catching up with you and swamping your motor and boat. This is because you have applied astern power and are actually backing into the wave. · Transverse thrust causing your motor to pivot to port (right handed propeller) so keep a firm grip on the wheel and be prepared for your boat to swing off course. · Damaging your gearbox and/or your propeller bush by going from full ahead to full astern. To avoid this you need those few seconds to allow your motor to come back to idle. Remember that if your boat is moving forward, even if you are in neutral, the propeller is turning. Reversing the turn at speed is about the same as going from forward to reverse in a car without stopping. A common cause of loss of life at sea is a person falling overboard. It is perhaps more common on larger vessels where people are moving around the decks. On smaller boats it should not happen because everyone should be seated, but just in case it does, you should have a plan in mind. · They are likely to be injured from the fall and may have struck themselves on the boat. · They are fully clothed without flotation support making it hard to stay afloat. · In rough seas and especially at night they are very difficult to see. In a small planing boat if the person is seen to fall over, it is unlikely that you will have travelled very far before pulling off the power. It is still vital that no time is wasted. This is where your boat handling skills may save a life. · Grab a life jacket and throw it towards the person in the water. It may provide some support, but if too far away it will at least give you a direction to follow remembering how hard it is to see a head in the water especially at night. · If the person is close to the boat, don’t be tempted to back up to them. While either you (or someone else for preference) keeps their eye out and gives you directions, execute a turn (which suits the sea conditions) and approach the person into the wind or current, coming out of gear just as you reach them. Getting them back on board will depend on the condition of the person, the seas and the height of the gunwale you may throw them a line with a loop in one end large enough to go over their shoulders and under their arms. If another person goes into the water to help someone seriously injured, make sure they have a lifeline back to the boat. If you are going to drag them to a duckboard at the stern, shut down your engine. If you were the only other person on board, what would you do? Give some thought to the possibilities of what you could do and what you should not do.